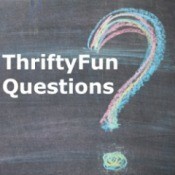 Fruit recipes submitted by the everyday experts in the ThriftyFun community. 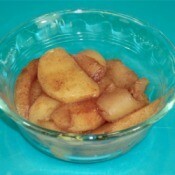 Making Cinnamon ApplesThis video shows you the step by step process to making cinnamon apples. 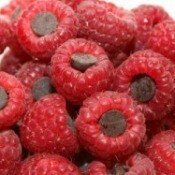 Chocolate Stuffed RaspberriesRaspberries and chocolate make a delicious combination. 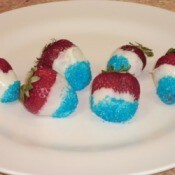 Watch this video and learn how to make these simple little treats. 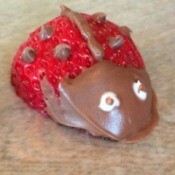 Lady Bug StrawberriesHere is a cute way to decorate strawberries for a party. Check out this video and learn how to make them. Easy Preserved LemonsThis is a simple way to make preserved lemons. A little drizzle of this stuff goes a long way when making salads, using as a topping, or in your marinades. It's great because it doesn't have just a lemon flavour, it's also got the taste of the dissolved lemon rind, which is amazing. There's nothing quite like it. 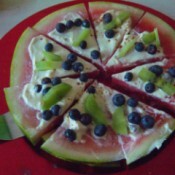 Watermelon Dessert PizzaA fun dessert or party treat that looks like pizza but is sweet! 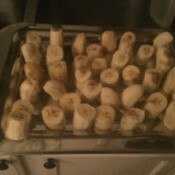 Frozen BananasThis is a good way to use up bananas before they go bad. You can easily use them for diverse purposes such as smoothies or banana bread, when you cut them up, freeze separately on a tray, and then put them in a bag. Using Ripe PeachesI have too many peaches! I've thought of stewing them to freeze for other baked recipes or sauces. Any other ideas, or a recipe for tomato and peach salsa? 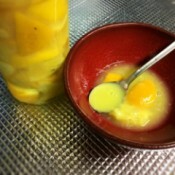 Recipes Using LemonsI need recipes using lemons. We have our own tree. Gravenstein Apple RecipesI have a Gravenstein apple tree with a hundred apples. I need recipes that are best using Gravensteins! Ideas for Using Wilted CherriesI know from reading this forum that there are a lot of resourceful people. I have 3 pounds of sweet red cherries that I purchased that were left in the fridge. They are not spoiled, but I would not want to eat them. Can anybody please give me some simple ideas of using them? Recipe for Pears Preserved in LiqueurDoes anyone have any recipes for preserving pears in liqueurs? Homemade Fruit Roll UpsHow do you make homemade fruit roll ups?